This Right Facing Sectional Sofas collection presents you with a variety of stylish and sophisticated sectional sofas. Adorn your home with this stunning collection featuring durable upholstery fabrics including polyester, linen and leatherette in a spectrum of refreshing colors. Sturdy frame construction with clean lines and neat tailoring make this sectional sofa collection one of its own kind. Enjoy a relaxing evening in style on this gorgeous Birch Lane Kerry Sectional. Radiant and refreshing pure white upholstery will brighten up your room while mahogany finished tapered legs beautifully complements the overall feel. Its blended-down cushions and plush track arms offer you luxurious comfort. The graceful Kerry Sectional comfortably seats six people and is a practical and smart solution for your seating problems. Crafted from sturdy wood and laminate. 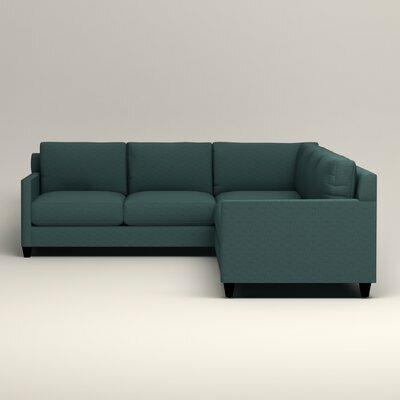 Parts of the sectional are designed to slide and fit together with the help of attached clips. Fabric color: Griffin Pure White Twill. Available in a wide range of fabric colors. Padded thickly with foam and fiber. Down blend cushions made from ultra-cell foam with crown padding and low melt bonded polyester fiber wrap. Tapered feet in Mahogany finish. Product Care: Vacuum frequently, spot clean with water-free solvents or dry cleaning products. The modern style and sleek look of Russ Sectional will add refinement to your home. Red faux leather upholstery is accented with tufts to create a stunning look. Matching ottoman allows you to store and organize your goods. The luxurious Russ Sectional is versatile furniture that will beautify your home. This sectional includes sofa, chaise and ottoman. Can split in to two. Ottoman with hidden storage space. Easy-to-clean faux leather cover accentuated with tufts. Available in more fabric colors including Black, Brown and White. Block feet in dark brown color. The elegant Right Hand Facing Sectional by Andover Mills features a clean-lined design with dual toned upholstery. The lovely combination of black and brown is very pleasing to the eyes and radiates inviting warmth. The faux leather upholstery adds graceful style while the soft-to-touch microfiber cover and plush button tufted cushions are immensely comfortable. 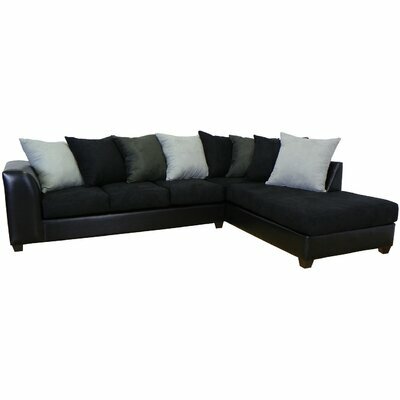 This sectional has hardwood frame to endure wear and tear of time for many years to come. Non-reversible sectional sofa with attached chaise. Wooden frame is covered in black faux leather. Cushions are upholstered in brown microfiber. Available in more color combinations including Java / Chocolate and Mocha / Chocolate. Removable seat and back cushions allow easy cleaning. Molded plastic legs in dark brown color. 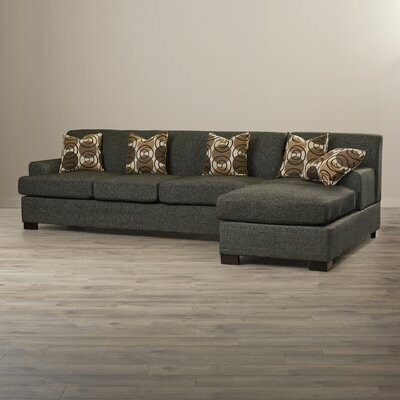 Adorn your living room with the warm and welcoming look Camden Right Hand Facing Sectional by Three Posts. The sturdy hardwood frame promises years of comfort and relaxation. Graphite colored upholstery, tufted cushions and stylish block feet in black color lend a refined look to this spacious and cozy sectional. It is cushioned with high-density foam for superior comfort and covered in microfiber for a softer touch. Made out of strong and durable hardwood. Also available in Pewter color. Sinuous springs with thick foam cushioning. Cushion back style accented with tufts. Introduce a relaxed environment to your living room with the modern Wildon Home® Sleeper Sectional. 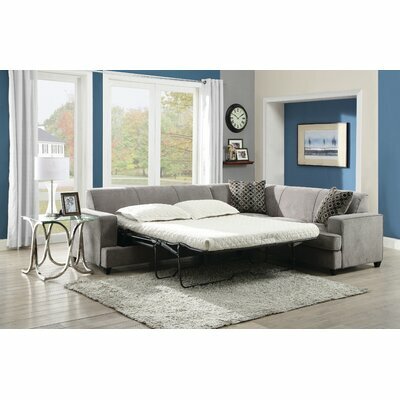 Immensely comfortable and completely casual, this modern Sleeper Sectional converts comes with a pull-out bed featuring Queen sized innerspring mattress. The warm Grey color of the polyester upholstery creates a welcoming feel. This lovely sectional is versatile and will be a great addition to your living room. Upholstery fabric is 100% polyester. Requires assembly and very simple and quick to put together. Length 109" 52.5" 29" 29"
Width 86" 54" 35" 35"
Height 34.5" 34.5" 34.5" 34.5"
The elegant yet stylish Burwood Sectional will bring a warm and inviting aura to your living room. 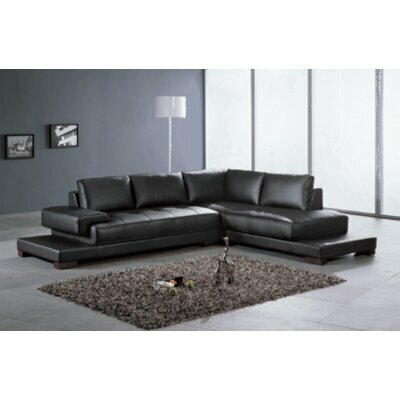 Sleek black bonded leather paired with matching microfiber upholstery accented with gorgeous graphite and lightning finished cushions create a stunning visual delight for a perfect living room décor. Hardwood frame for maximum durability. Color: Black/ Black/ Graphite / Lightning. Available in multiple colors with enchanting combinations. Frame is covered in faux leather while cushions are upholstered in microfiber. Cushion covers can be removed. Black tapered feet are molded out of plastic. Requires assembly and very easy to put together. Add chic style to your living room with the versatile Spirit Lake Sleeper Sectional. The multifunctional Spirit Lake Sleeper Sectional comes with interchangeable arms that allow you to orient the sectional in various configurations. Refresh the look of your living room by installing both arms on either sofa or chaise for a different look each time. The bold black upholstery features tufting details for a chic and style look. Spirit Lake Sleeper Sectional Collection. Crafted from environmental friendly and durable wood. Reclines to convert in to a sleeper. Click clack mechanism easily allows fast conversion from seating to sleeping position. Sofa and chaise can be used as individual units for seating and sleeping. When chaise is placed in front of sofa, the overall sleeping surface almost maximizes to the size of a Queen bed. This versatile sectional is reversible. Premium PU leather upholstery looks great is durable and low-maintenance. Available in more fabric colors including Dark Brown and White. Lusciously thick foam cushioning for more feel and extra comfort. Interchangeable arms allow countless possibilities for various interesting configurations. Gold Sparrow offers warranty on replacements of parts only within a reasonable timeframe if parts are available. Bring luxurious comfort to your living room with the elegant Mila Reversible Chaise Sectional. Skillfully designed for beauty, seam strength and wearability, this lovely sectional will adorn your home décor. It is a reversible sectional. Chaise can be placed on either side. Upholstery finish: Faux Linen Black. Also available in Faux Linen Slate. Sofa features three cushion seat. Chaise features two cushion seat. Create a mesmerizing focal point in your living room or guest room with the gorgeous Ruby Sectional by Hokku Designs. It features soothing beige colored bonded leather upholstery that radiates elegance and freshness. The sophisticated look of this sectional will win you praise from your family and guests. Includes a sofa and a chaise. Upholstered in easy-to-care faux leather. Back and sides are covered in matching leatherette for an elegant and refined look. Available in more fabric colors including Black and Red. Supported by wooden block feet in gorgeous dark Mahogany finish. Hokku Designs provides 6 months warranty on craftsmanship. Create a dashing seating arrangement in your modern living room with the gorgeous Morgan Sectional by DG Casa. It is manufactured from solid hardwood that renders durability to the structure to endure wear and tear of time. 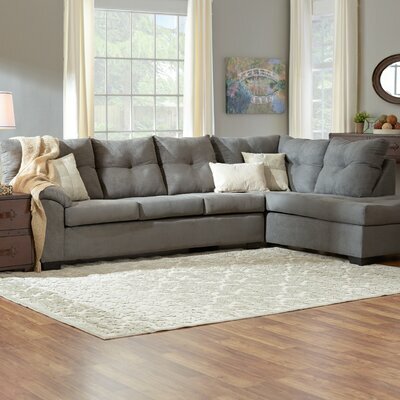 With clean, crisp lines, charcoal upholstery and pointed stainless steel legs, this comfortable and stunning sectional will prove to be the stylish addition to your home. Upholstery fabric is blend of polyester/polyester. Hand stitch detailing on solid pattern. No-sag sinuous spring at the core. Track arms on both sides. Uniquely designed pointed stainless steel legs. DG Casa provides one year limited product warranty.